Video conferencing software has become an essential part of communication within all types of businesses. Whether it’s communication with prospects, employees, partners or customers, the right video tool can give your meetings a real boost. Zoom unifies cloud video conferencing, simple online meetings, group messaging, and a software-defined conference room solution into one easy-to-use platform. With Zoom’s high quality video and audio conferencing, you can collaborate with colleagues, give presentations, perform product demonstrations, and deliver companywide messages to up to 10,000 attendees. Zoom offers different types of plans for business of all sizes. The software can be tailored to both small and large corporations. Include over 25 participating video streams, 10 hosts and up to 200 listeners and viewers in your meetings. Zoom comes with a simplified interface and HD video and audio. You can use dual or multiple screens depending on the demand of your meeting. Share your computer screen and record meetings to your computer or the cloud. Chat with other participants or groups and share content like video’s. Enjoy the full suite of collaboration features that will offer you a consistent enterprise experience. At Duppal we understand that your time is tight and your online meetings need to work smooth, all the time and everywhere. Simple but efficient video conferencing, that is what you need. 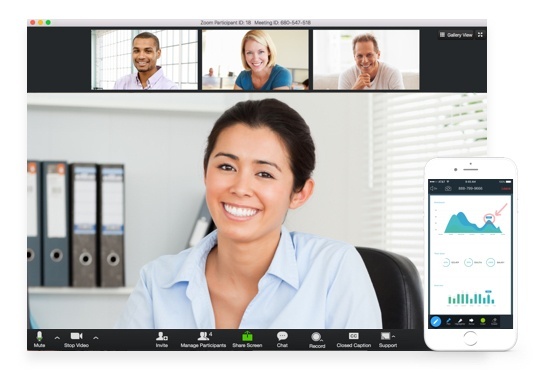 With Zoom, you get a great video meeting experience from your desktop, mobile device and conference room. Try it yourself and discover why over 750,000 companies worldwide have already embraced the power of Zoom. Zoom offers two types of meetings: planned and instant. This gives you the flexibility to start a meeting whenever you want. Start or join instant meetings at the touch of a button. Participate in scheduled meetings with a personal meeting ID that is sent via email or agenda invitation. Plan one-time or recurring meetings. For remote collaboration you easily create your own huddle room. Get more out of your meetings with simple, efficient video communication. Duppal helps you choose and implement a Zoom videoconference package that suits your business processes. We are happy to inform you about the possibilities.